It takes a certain amount of bravery, imagination, and sometimes desperation, to want to leave a remote island home that’s been base for a family for many years, and uproot from its rural idyll to the grimy urban streets of Glasgow, or for the new dawn of America – particularly in 1861. 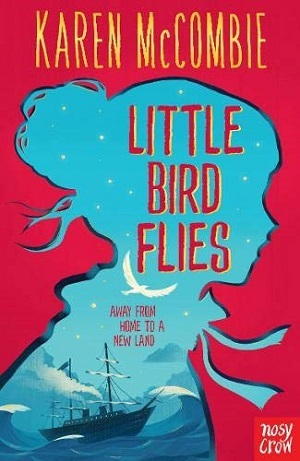 But that’s what the Little Bird of the title wishes in this new historical series from children’s books author Karen McCombie. Bridie is a crofter’s daughter (her father occupies and works a small landholding known as a croft, rented from the landlord, or laird). She lives with her family on the little Scottish island of Tornish, an island that appears almost as a character itself within the novel. With a wasted arm and leg, a deceased mother, two older sisters and a younger brother, life is hard, but also rewarding. Bridie very much sees the positives in life – not only her island idyll of rough seas and craggy landscapes, cherishing the views and wildlife – but also always working with the positive side of her disability. She doesn’t let it impede her, but rather uses it to her advantage where possible. But things change in Tornish when the current laird dies suddenly, and a new family take over. Even then, Bridie sees positives in her new friendship with a ward of the new family, and a portrait painter drafted over to paint the new laird, but life gets harder for all the crofters and before long her dream to leave Tornish comes true – although perhaps not quite in the way she had envisaged. At this point the novel speeds up spectacularly – as though McCombie is in a hurry to leave it positioned for book two. This is quite a unique book, documenting a particular way of life in a particular place, and written with a huge amount of understanding of the time and location, as well as with clear passion. This shines through in Bridie’s own pride in where she comes from. The book is modern in its telling though – Bridie’s outlook is contemporary – she sees goodness in difference rather than shunning it, she’s up for adventure and exploration, and she feels almost feminist in outlook – the women in this story dominate and are strong risk-takers, working to do good and make their mark. There’s a feeling of class injustice with the portrayal of the privileged and careless wealthy gentry, who can be seen in a way as invaders – destroying the isolated island way of life – and forcing the residents to change how they live, or flee. And so despite the strong traditions highlighted in the first part of the novel, McCombie portrays a world in flux. Changes come to old ways of life, people move on and move away. With skill, McCombie presents this tear in the fabric of the crofters’ reality – the striving for modernity and adventure combined with the nostalgia for a simpler and more idyllic way of living. The history of the Scottish isles feels captivating – the landscape rugged and real, forging onwards even when the people themselves are long gone. And although the reader is thrust forwards into Little Bridie’s seagoing adventure, it’s the island that stays behind in the reader’s mind – a timeless sliver of land that feels just within reach. 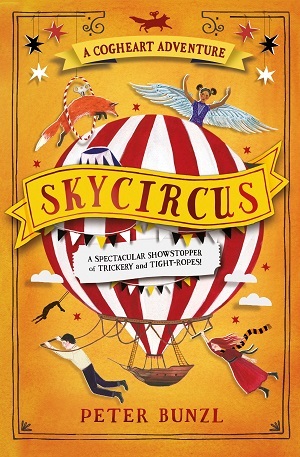 Particularly for little birds that fly, and McCombie gives the reader wings to do just that. You can buy it here. 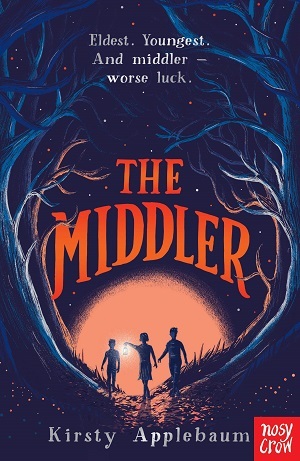 There’s a glut of new middle grade books arriving this January, and it’s intriguing for a reviewer to try to pick up on a ‘trend’ or theme running through them. What were the writers preoccupied with while they were writing, what did they want to say? Amber Lee Dodd’s Lightning Chase Me Home feels personal from the beginning. Told in first person narration by Amelia Hester McLeod (named for two explorers: Amelia Earhart and Lady Hester Stanhope), this is a heart-wrenching tale of a girl embarking on a new adventure herself – starting a new school. 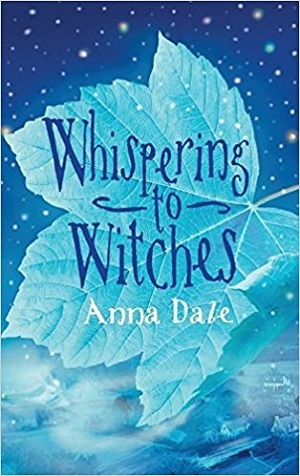 Amelia is immediately endearing – and struggling – her mother is absent, Amelia suffers from dyslexia, and to make matters a little more complicated (and fictional), after she makes a wish on her eleventh birthday off her small Scottish island on the Serpent’s Tooth Rock – she finds herself magically disappearing and reappearing elsewhere. Will she work out why, and can she use it to find the courage to push through, and maybe, maybe could she use the strange power to find her mum? Lightning Chase Me Home is one of those treasured novels for the 9+ audience, packing in a great plot, some magical realism, but also issues that dominate ‘primary school and beyond’ discussions – how to deal with an elderly grandfather who doesn’t always remember where he is, managing with the emotions invoked by an absent parent, the constant building of resilience and harnessing bravery, and the power of folklore and magic to explain our own small lives. 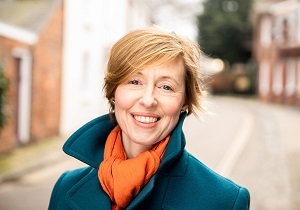 Dodd has a gift for identifying the makeup of a person – be it the objects that help to define us and our relationships, the difficulties some children have in learning or making friends, and how schools and parents deal with this, and the understanding that not all people are what they first seem. Amber Lee Dodd portrays her main character with an acute sensitivity, but manages to weave in magic, a sense of great explorers of the past, and an endearing friendship that feels as real as it is strong. Below, she reveals why Amelia is so close to her own heart. As someone with dyslexia, I thought that writing and reading were impossible. Before secondary school, I had real struggles with reading. In fact I hated it! I hated reading, I hated writing and I hated books. I sat in my special needs classes reading Fuzz Buzz books. Books about a blue spiky ball with enormous legs who never did anything more exciting that remark on the weather. If this is what books are, I thought, there is no point in me learning to read. But even when my teachers gave up, saying I was hopeless, my parents refused to. They would make me read through my reading books again and again. I ended up memorising them from the pictures before I could make out the words. Slowly, painfully, I started to recognise words, memorise them and store them away. My word bank began to build, until one day, like magic, I realised I could read. After spending so long struggling to read, when I finally could it felt like I had personally discovered books. At school, I would pour through Tintin and Asterix comics. I read every book on how to care for everything from puppies to pet spiders. Then I found even more books to fall in love with, The Worst Witch series, Jacqueline Wilson’s books and Malorie Blackman’s. Once, I spent a whole day on a kitchen chair with Double Act wishing desperately that I could be a twin. The only thing better than reading turned out to be writing.For a long time it was the one and only thing at school I was good at. I found that I could invent stories from thin air and filled pages of my exercise books with big wobbly writing and dramatic inky pictures. I once even made my teacher cry with one of my stories. Writing stories became my super power. And I want to share that power with everyone. 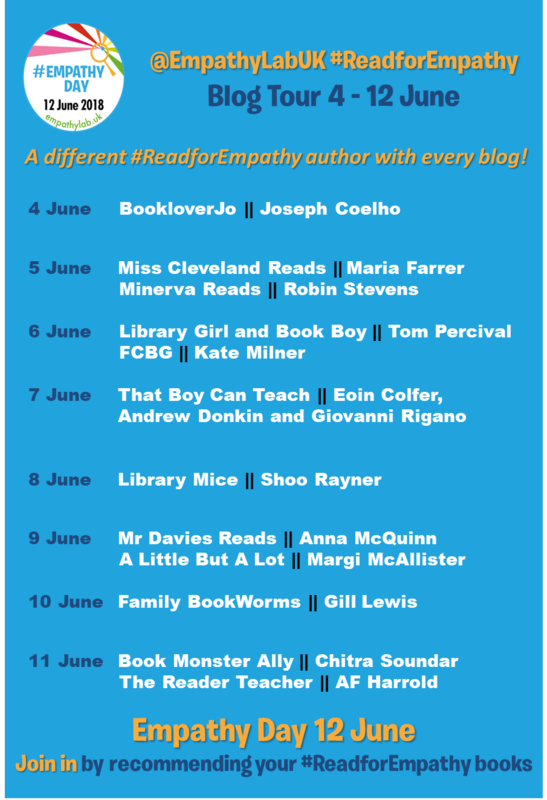 So here are my top tips for dyslexic writers (and for non dyslexic writers too). Firstly, don’t worry about your spelling. I still make massive spelling mistakes. 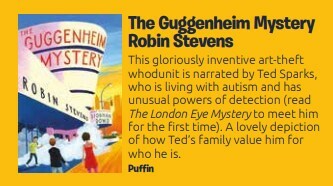 My first book had a spelling mistake in the very first sentence and it still went on to be published. Plus writers get to work with magical people called copy editors and like teachers they can fix all your spelling mistakes. Being creative does not include being an expert at spelling!. Secondly, read. And read lots. Don’t worry if you’re slow about it. It still takes me about a month to finish reading one book! But I take a lot of that book in. And I still go back and reread things if they didn’t make sense to me first time or I jumped a few lines. It may be a slow process, but the advantage is you can learn more from it and start to unravel how the author put things together. Thirdly, don’t worry if you’re doing it differently. My dyslexic brain makes me jump all around a story narrative and I often have to write quite a bit before I can sort out the plotting. Find a way to organise your thoughts and ideas that works for you. Some people make visual diagrams,or come up with places their characters visit and fit the plotting around that.I write lots of lists and notes and flow charts often on the back of used envelopes. There is no right way, only the way that works for you. And lastly, for me the best way to start a story is just to start writing it. Write that first line. Make it intriguing, or scary, or funny. Make it the best first line you can think of. Then think of who that first line is about. How are they feeling? And what’s happening to them? Stories are all about questions and finding the answers to them is half the fun. There’s much to extrapolate in Lee Dodd’s second novel, many issues and great characters, but in essence, Lightning Chase Me Home is a good adventure story. Amber Lee Dodd’s first novel, We Are Giants, is reviewed here, and you can purchase Lightning Chase Me Home here. Gourlay’s latest novel sees her attempt to give voice, with a first person narrative, to the native Filipino’s view of history as she describes a boy on the brink of manhood in a tribal village in 1899. Although she fictionalises her story, this is a rare view of history in this land, seen before only through the eyes of occupying forces or anthropologists. Samkad is about to undergo the ‘cut’, the ceremony that turns him from boy to man and lets him join the warriors of his tribe who are fighting the headhunting enemy. Samkad’s innocence is apparent immediately. He has never met anyone from outside his tribe, or been beyond the marked territory of the village’s paddy fields, and he also enjoys his time with his friend Luki, a girl who is also desperate to be a warrior, although held back by the view of gendered roles within her tribe. However, his innocence is not seen as a negative, and Gourlay writes intelligently about how he thrives within his community, and the importance of the community’s ‘innocence’ – the fact that they are undisturbed. However, it takes more than a cut to make a man, and when Samkad’s coming-of-age ceremony is derailed, and a pale-skinned man, an American, arrives, Samkad and the reader learn that experience, not necessarily ritual, is what changes a person. Gourlay is terrific at describing the landscape of Samkad’s village, from the mountains of rice paddies to the trees that surround them, but mostly at the intricacies of the customs of the tribe, the hierarchical structure of their community, and the rituals, sacrifices and beliefs that bind them together. Soon, it’s clear that the existential threat to the tribe comes not from enemy headhunters or snakes, but from the Americans, who aren’t as friendly as they first appear when they come bearing sweets as well as guns. The story is fast-paced and written with an immediacy and visceral quality that immerses the reader in Samkad’s way of life and his emotions. Gourlay tells the story with an immense sensitivity towards the way of life she is describing but also with heat and power. The Americans bring a different kind of knowledge to the tribe – some of which is good and useful, and some of which is highly dangerous. As well as exploring these ideas, Gourlay poses questions about the nature of land ownership and territory, about warfare, and community, about changes that come from within as well as what happens when new people arrive. The story is about culture, belief, loyalty and the meaning of community and is historical fiction at its finest, with a fresh and invigorating outlook. Age 10+. You can buy it here. Another child facing her rites of passage ritual is Storm in Storm Witch by Ellen Renner. Now 13, she must undertake the Choosing ceremony to see if she will be claimed by one of the Elementals: Air, Water, Earth or Fire, and this Choosing will determine her course in life – her vocation. This is a fantasy novel set in some distant land at an unspecified time, but it’s clear that inspiration has been taken from a rural life – Storm’s village community lives from the land – pots are fired, food is fished or hunted, and cloth is woven from natural product. This is a place and time in which technology hasn’t been harnessed. 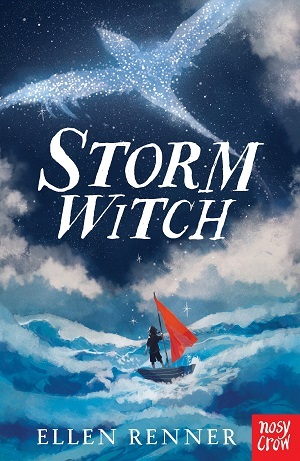 In a highly unusual occurrence, Storm isn’t chosen by one Elemental, but three, turning her into a witch, and one whose powers are not understood even by the village Elders, headed here by a matriarch. When the village is under threat from the Drowned Ones, (a separate tribe who live at sea) will Storm be able to harness her powers to save her community and particularly those she loves? Renner has built her world around the power of the elemental forces of nature, and throughout the novel Storm’s people either harness the power for their own use, or suffer its dangers. This works cleverly, so that fire is a dangerous element with the power to destroy, but also of course with the nurturing power to bring heat and light. Water too is dangerous if combined with wind, but is useful in providing a way of passage to trade, and also for its fish. The reader feels at one with nature too reading the book, as though the sound of the sea is a constant backdrop to village life. The magical elements are woven naturally into the landscape and don’t feel too fantastical, more a way of life and part of the rituals and beliefs of the society Renner has created. But what stands out most is the authenticity of her characters. Storm is a great teenager – on the cusp of womanhood but still bound into childhood squabbles and fighting, split between the childhood of her younger cousin and yet wanting to be part of the adult conversations, and desperate for adult wisdom and knowledge. She is modern in her outlook – her haste and impatience showing through, but also her loyalty and love. The other characters are fully fleshed too, from Storm’s patient mother to her guide and Elder, Teanu. This is another community set apart and cut off from others, and so strangers are unusual, and when one arrives he brings excitement and danger. This novel too is fast-paced and powerfully written – and although I am generally not a great fan of fantasy, I remained gripped and bound to Storm’s world. Age 9+ years. You can buy it here. 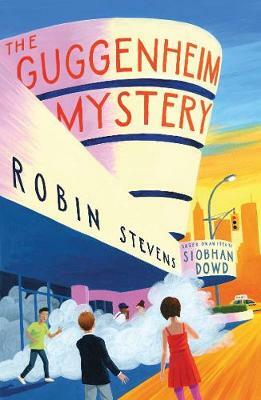 This isn’t a new book or even a new edition, but rather was a summer read for our family, and intersected with these other two books so neatly that I couldn’t help but mention it. 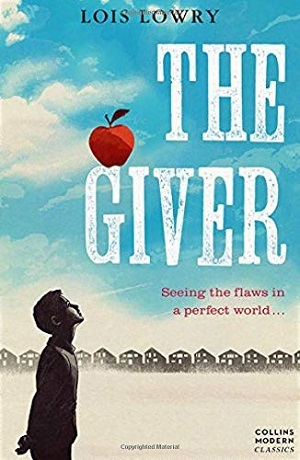 For those of you new to it, The Giver tells of another community – set in a dystopian future, cut off from the rest of society and indeed from history. It follows a boy called Jonas who is also approaching his ceremony of adulthood – when at 12 the children are assigned the jobs and roles they will play within the community for the rest of their lives. However, Jonas is given a rather different job than the rest of his cohort: he is to be the new Receiver. This is an unsettling futuristic read about a ‘utopian’ world in which all aspects of pain and suffering have been removed, and fairness rules. Each matched couple is given two children, a boy and a girl, whose own adolescent stirrings are repressed with medication. None of the community has memories, and the elderly and those who don’t fit are ‘released’ with great celebration. Lowry gradually builds up the reader’s awareness of the world as they progress through the book, so that the reader is more and more unsettled, until the full scale of the ‘utopia’ becomes apparent. When Jonas receives his new job, and starts to be fed memories of what human society used to be like (in order that he can dispel advice and wisdom to the Elders), the reader realises what the community has sacrificed and the path they have chosen, most unwittingly, and the reader’s moral compass kicks in to question which elements make life worthwhile and valuable. This is a fascinating allegorical book that stimulates questions about how we live, about difference and sameness, about memories and creativity, about beliefs, rituals and community. It’s dark but simply told so that the horrors creep up stealthily. Lowry’s skilfulness in writing is immediately apparent. The prose is disturbingly simple and information is only drip fed until the reader is so immersed with Jonas, so emotionally entangled and engaged that they could not possibly release him without reading to the end. It’s a powerful and provocative novel and poses many more questions than it answers. Age 11+ years. You can buy it here. My Isadora Moon series is about a little girl who is half-fairy and half-vampire. 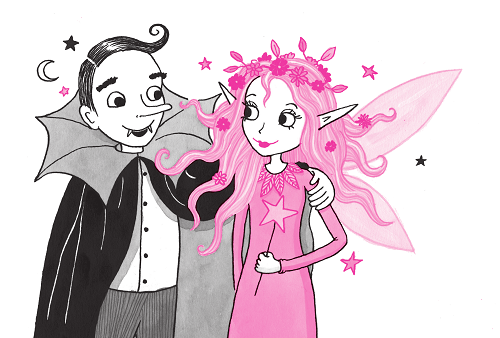 Her mum’s a pink, flowery, nature-loving fairy, while her dad is a slick, gothic, night-time vampire. That means she’s a bit of both: she loves doing ballet in her sparkly tutu, but she also loves swooping through the night sky. Just like Isadora, I too love the look of both glittery pink fairy visuals and sleek black gothic aesthetics. And I especially love mashing the two things together, which is how I came up with Isadora Moon in the first place. But how about you? Are you more on the side of Sugar & Sparkle or of Fangs & Moonlight? This list of my top five picks from each side (in no particular order!) should help you decide! 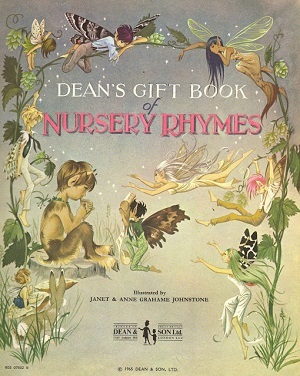 Presented as handbooks for fairy spotters from the perspective of someone who lives with fairies, the Betty Bib fairy books have always been a huge inspiration to me. 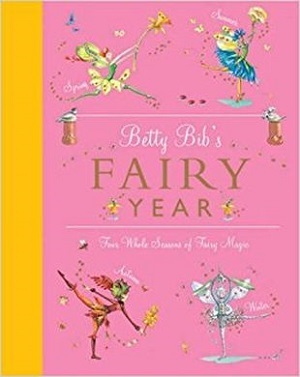 As the title suggests, this book follows the lives of fairies over a whole year. I adore the mix of 2D watercolour illustration with photographs of beautifully-dressed 3D models of fairies. As someone who loves to make things, these photographs just captured my attention and I spent hours poring over them when I first discovered these books. Oh my goodness, I love Pongwiffy! This ‘witch of dirty habits’ lives in a filthy hovel in Number One, Dump Edge, but don’t let that put you off her: she’s hilarious. Kaye Umansky’s world comes to life with a memorable supporting cast of witches and wizards, each with their own distinct personalities. When Pongwiffy takes it upon herself to book a trip to the seaside for her coven, I love seeing them all cope on a British beach holiday for a week with no magic. Ivy Wallace presents the sort of old-world fairytale charm you almost never see any more with her beautiful paintings of a quaint forest inhabited by various elves, fairies, pixies and, of course, Pookie himself. 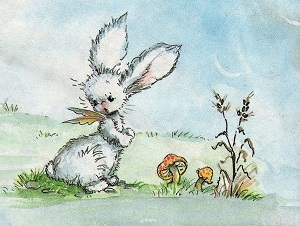 Pookie is a fluffy white rabbit with little fairy wings that don’t fly. He’s not like the other creatures and has nowhere to belong. This first story is about how he finds someone to love him and how she helps his wings grow so that he can soar through the air. The Dorrie books are some of my absolute top favourite books of all time! 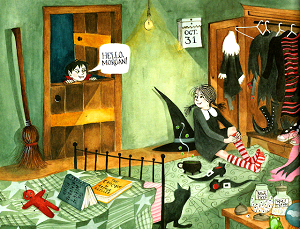 Dorrie is just the cutest little witch with her odd socks and black cat, Gink. She lives in Witchville with her mother, the Big Witch. 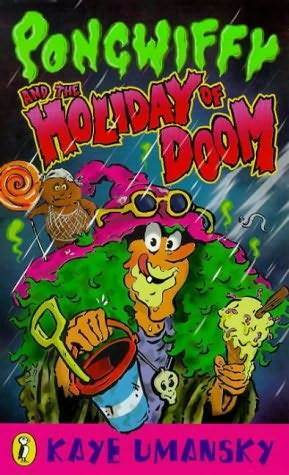 In this book, the villainous Thinnever Vetch plots to steal the enchanted eggs of the Egg Witch’s magic hen. 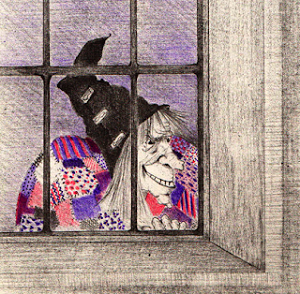 I was actually terrified when I first turned the page as a child and saw the picture of Thinnever Vetch spying through Dorrie’s window! Mostly though, I love the creepy yet comforting atmosphere of these books. I also love Patricia Coombs’ use of pencil and crayon to create her soft and wispy illustrations, often only in black and white or with one or two other colours. Like Pookie, this is another book full of old-world charm. While the text is just the classic nursery rhymes you would find in any similar collection, it’s the lavish full-page illustrations that draw me in. I love the really sumptuous way the two illustrators colour and shade all the clothing, such as the billowing skirt of the old woman who lived in a shoe. 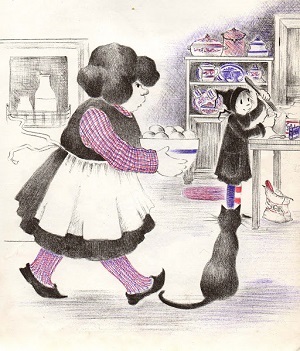 Even though the style and fashions are clearly from the 1960s, the illustrations have a timeless quality. My favourite picture is of the anachronistically ‘punky’ fairies on the title page, with their wild pink and green hairstyles. I love spooky, gothic children’s books, but I don’t actually have too many about vampires! This one charmed me with its pastel illustrations and warm, comforting atmosphere. It’s a very straightforward story for younger children about a vampire and a witch who set out one Halloween to discover if children are real or not. When they find themselves at a Halloween costume party full of ghouls, zombies, vampires and witches they are confused. Are these real children? It’s all the detail in the pictures though that really bring the story to life. This picture book is about as Fangs & Moonlight as you can get. 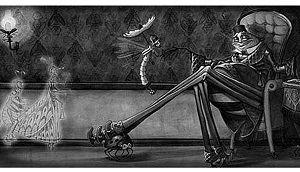 Every page of this nineteenth century cautionary poem has been lavishly illustrated with elegant and gothic greyscale spreads, often featuring comically macabre details such as the dead ladybird footstool the spider uses. Inevitably the suave top hat-wearing spider succeeds in luring the naïve and dainty fly into his web, but the illustrations are just on the light enough side of gruesome to appeal to its young audience. Like Lynne Reid Banks’ most well-known series, The Indian in the Cupboard, this story is about someone meeting a miniature person who becomes a part of their life. This time, instead of a toy Indian, it’s a denim jeans-wearing fairy. My absolute dream would be to turn myself into a fairy, but my next best thing would be to meet a real, living tiny person. You can see then why this story would appeal to me! In this story, the fairy Tikki makes friends with the human Jan. The one thing Jan really wants is a child, and Tikki has the power to grant this wish. The only problem is that the fairy queen forbids any fairy to do magic for a human. 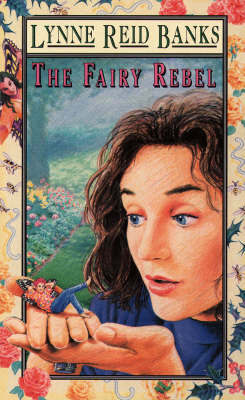 Like The Fairy Rebel, this novel is aimed at older children to young teens. What I look for in my favourite books is a cosy, comforting atmosphere I can get lost in, particularly when mixed with a slightly gothic vibe. This book definitely has that, not least because it’s set around Christmastime. I also love that it’s set mainly in the everyday world from the perspective of a normal boy who happens to meet a witch and get drawn into a mysterious plot involving an evil witch. This book is full of mystery, suspense and magic. So which side draws you in more? Will you be checking out my Fangs & Moonlight suggestions, or are you more intrigued by the Sugar & Sparkle side? Looking through my shelves to put this list together, it’s easy to see which way I lean: I have far more fairy books than gothic ones. 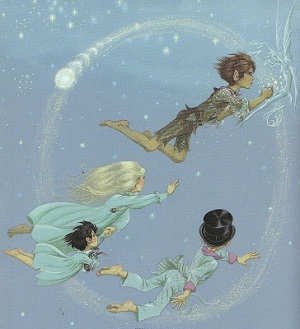 I even went through a fairy obsession as a teenager, collecting up anything fairy-related. That’s not to say I don’t still have a great love for all sorts of spooky and gothic children’s books though. Even though I love Sugar & Sparkle, my library just wouldn’t be complete without a mix of the two, and I think the way I smooshed them together with Isadora Moon is the perfect expression of my love for both sides. 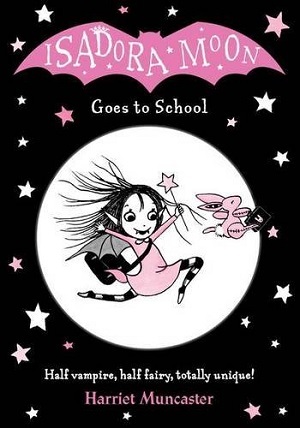 To buy Isadora Moon, click here. With thanks to Harriet Muncaster for her knowledgeable insights. Hasn’t everyone at some point imagined that they could escape into another world? Whether it be into Narnia through the wardrobe, or cutting a hole in the air with a Subtle Knife, or even discovering a new place within our own world that holds such a different atmosphere, such an exciting contrasting place with our own reality (perhaps through a doorway into a Secret Garden), that new possibilities arise. Guy Jones provides this opportunity for his protagonist, Jess. A girl who needs new possibilities more than most. Jess is allergic to the sun. She lives a confined life, in the rooms of her own house, or behind the tinted windows of her car, and also within the sterile walls of the local hospital. So when she moves through the trees at night and discovers an ice garden beyond the local playground, in which her skin never burns, she feels as if a whole new world of adventures is opening for her. But someone else has left footprints in the snow, and a garden made of ice has its own fragilities. 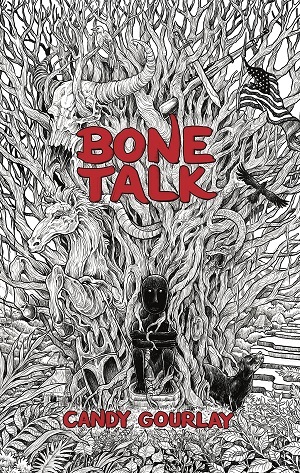 This is a slight novel in terms of pages, but a novel brimming with a richness in words, plot and character. Enticingly written, in that the words are both lyrical and yet gripping, the reader is swept along with Jess, feeling for her in her contemporary world in which going outside means donning ‘Full Hat’ to avoid exposure, and yet also breathless with excitement for her when she enters the Ice Garden, and just as enchanted with all it contains. Jones has a magical way of describing the real world. Jess’s relationship with her mother feels authentic and heart-breaking, as her mother and Jess are consistently torn between wanting freedom for Jess and a lack of constriction, and yet a protectiveness – Jess of her own skin, and her mother of her own child. Yet Jones also manages to conjure a quite incredible fantasy landscape too – letting loose his imagination with new creatures, but also playing with features of this garden to make them into a playground for Jess (something she has so wanted). There’s a maze, a groove that acts as a slide, and endless ice features, as well as elements of fear and danger. He also gives a nod to other ‘portal’ adventures, expressing Jess’s disappointment that time in the real world doesn’t stand still while she’s in this ‘otherworld’ but continues as normal. 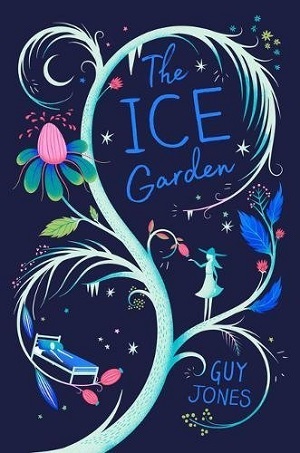 What the ice garden does do though, is make her see her ‘normal’ world as quite remarkable. This is mainly due to the friend she makes within the ice garden – another asset the garden gives Jess which she had most desired. And it’s the friendship that opens up her eyes to the meaning of loneliness and solitude, which allows her to fully explore the meaning of her illness, the saving capabilities of storytelling, and the tenderness that can exist between people. The other theme that runs through the book is that of nomenclature. When Jess encounters new things within the ice garden, she gives them names, hence attaching her own emotional significance to them, giving the unknown an indication of the characteristic she sees it possesses – and therefore how she should interact with it. Jess’s naming of the species gives her delight and when she encounters it again later, she refers to it as her own elephant mouse. This ownership and tendency towards colonialism fades as Jess realises that there is another within the garden, and also makes her think – to whom does the garden belong – for gardens are made, they are not freeform landscapes. When, in the end, Jess’s two worlds collide, she comes to discover that she can make friends in her own world – in fact she already has – and that she can live without her illness defining her. Jones writes with a sophisticated tenderness, and a confidence in his story that satisfies the reader and leads to deeper thought. An accomplished book that should live long after the ice melts. You can buy it here. Elphinstone’s stories whisk away the reader into a fantasy landscape with more than a hint of magic, where nature beguiles the reader and becomes more than a setting, nestling as a fundamental character inside the story. Her first trilogy, The Dreamsnatcher, told of Moll and her quest against evil. 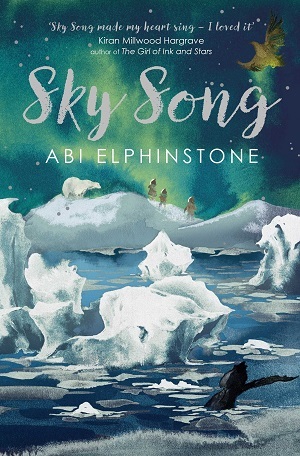 Sky Song also pitches a fiery youngster against evil, but here, Elphinstone has woven elements of the current political and social climate into her book, and borrowed from time old fairy stories and folk tales to excavate a new kind of modern story. Eska, held captive for her voice by the Ice Queen, breaks free from her musical box prison, but remembers nothing of herself or her past. When she learns her destiny: to journey to the Never Cliffs and sing the powerful song to win back the lands of Erkenwald from the Ice Queen, restoring them to the rightful tribes, she learns that she is also is in a race against time and the Ice Queen, who is desperate to steal back Eska’s voice. But once freed from the music box of the Winterfang Palace, Eska finds it hard to make friends and allies. The tribes are mistrustful of her. She must prove that she too wants to be rid of the Ice Queen forever, and that although she does not have a tribe of people around her, she has a different tribe, filled by creatures of nature, which may be just as powerful. The power of the voice, (it will give the Ice Queen immortality), and the stealing of it, works powerfully in Elphinstone’s book. Of course there are the inevitable allusions to Philomela, whose tongue was cut out in Ovid’s Metamorphosis to prevent her from denouncing her male attacker, and who was eventually turned into a bird who sings. There are allusions to The Little Mermaid – another feisty young girl who sold her voice for humanity (or so she thought). The book revisits Telemachus’s proclamation to Penelope that ‘speech will be the business of men’ and challenges it wholeheartedly. For the power of a young woman’s voice is still relevant in 2018, a year in which this resonates more than most – being the 100th anniversary of Women’s Suffrage. Following the power of Anne Frank’s voice, of Malala’s voice, of #metoo – the rise of the woman’s cry, even against another woman, speaks to the power of speaking up for yourself, for believing in what’s right and fighting for it. The book is first and foremost an icy adventure, with a journey through shiveringly cold frightening landscapes, magicked by the sorcery of the Ice Queen, where avalanches tumble, and lakes hide monstrous depths. But it is also the story of friendship and bravery, as Eska and her friend Flint, along with his sister Blu, traverse mountains together and use teamwork to overcome adversity, and triumph against the Ice Queen. Most of all, Elphinstone has shown the reader that belief is important. Belief in oneself and one’s own voice, but also in one’s own talents even if they are scorned by others (Flint is a master of invention – in this case using magic rather than pure science). Although there is no overt religion discussed here, as perhaps the reader saw in Northern Lights by Philip Pullman for example, there is an overarching belief in spirituality – that there is something greater to strive for than one’s own selfish desire. Elphinstone has divided the peoples of her book into tribes, Fur, Feather and Tusk, and initially the society is shown as having lost its belief system, because being cowed by one evil being (the Ice Queen) has made each tribe more inward-looking. Even more than that, The Ice Queen has caused ripples of fear, and so the tribes have turned not only inwards, but against each other, and harbour an intense fear of strangers and outsiders, lest they be spies or intruders. By the end of the book the message is clearly that tribalism may not work, that strangers do not necessarily have evil intent, and by working together, evil can be overcome. As well as the large messages within, this book showcases a writer coming into her own. The descriptions are lush and appealing – the flump of snow flopping from a branch, and crack and pop of the river melting – a feeling of Narnia-eque bursting into spring. The Ice Queen brings memories from The Snow Queen, and the fairy tale language of the voice-over prologue lends itself well to the feeling of timelessness and gives an all-encompassing setting to Erkenwald and its various tribes (although less confident readers may wish to get straight into the story of Eska). There are numerous child-friendly touches within the story – the protagonists are children of course, but there are hideouts and dens lovingly described, and a constant flow of energy and vivacity sending their tendrils through the story. Eska’s oneness with nature is brilliantly evoked – she uses nature to feed and clothe herself – sewing with sinews, learning to hunt without her shadow giving her away. There is also the touching character of Blu, shown with a mild intellectual disability, but it is noticeable that the older children and adults are those least forgiving of this; Blu is easily accepted by Eska, Flint, and those with kind, open hearts. This is a fantastic story of friendship, nature, overcoming adversity, but most of all acceptance and belonging. Always enthralling and daring, it speaks to our darkest fears and our intrinsic faults, and yet to an ongoing belief in the strength of humanity and empathy to pull us through. You can buy it here. Writers love to inflict great harm on their characters – the more dramatic their downfall, the more a novel can pack a punch. And Lauren St John’s latest novel certainly puts her main character to the test. Sadly, it was the all-too-real plight of orphaned and abandoned children in Zimbabwe (those who have lost parents, become war children or refugees), which inspired St John to pen The Snow Angel. However, like all good children’s literature, it not only reflects the world but strives to find a positive note, an optimistic resolution, showing the goodness that can be found too. Eleven-year-old Makena lives happily in Nairobi with her mother and father, and like her father (who is a mountain guide), she adores the mountains, and she hopes that one day, with his help, she will climb Mount Kenya. But, as can sometimes happen in life, one day everything she knows turns upside down, and she is orphaned and alone, and St John shows the reader just how far children can fall in a flash. Although Makena is taken in by a family member, she is treated abhorrently, and runs away, managing (just) to carve a life for herself in the Nairobi slums. Here, surprisingly, St John changes perspective briefly to a third person adult point of view, an unusual proposition in a children’s book, to explore the narrative from a rescuer’s viewpoint. Makena, seemingly, is in too much danger and too weak to view what happens next. The introduction of an adult’s perspective here (Helen, a woman rescuing children from the slums) gives the reader a new insight and, then, once switched back to Makena, shows how redemption can come, although slowly, and happy endings abound. The issues within this book are many and layered, and yet the reader never once feels as if they are reading an ‘issue’ book. The book touches upon ebola, famine, child soldiers and the like, explaining the reason for the multitude of children living alone in the slums, but far stronger than the issues is St John’s evocation of the setting – the beauty of the African mountains, the colour of the fruits and scents of food at roadside vendors, the wonder of flowers and plants, and the overriding sense of the healing power of nature. Lauren St John keeps eking out pockets of hope even in the midst of Makena’s deeply despairing situation. From the friendships she forges around her, to the talk of inspirational people, to the optimism she encounters that shows her a way forward. This is mainly down to a character called Snow, another child all alone, who teaches Makena how to find the good in things – how to have ambition and believe in a future, and to see the magic in everything. There is, in fact, not a blatant magic in the book, but a subtle undercurrent of coincidence, folklore, superstition and in the end, an animal that seems to be able to show Makena the right path, physically and spiritually. As with real life, there is wonder in the world if you look for it. This is brought to life not only by the story, but by Catherine Hyde’s subtle interspersed black and white illustrations, which increase the idea of magic, nature and this sense of wonder. But overall, and what drives the narrative, is not just the goodness and kindness pointed out by St John, but the vivacity of the characters. 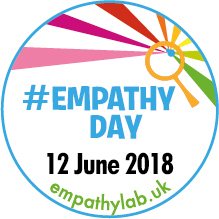 Each child, in their struggle to survive, shows believable tenacity and courage, and each adult is rounded and real – not completely selfless, not completely faultless, and when it comes to the ‘baddies’, not completely evil. The characters are as diverse and vibrant as the settings. Not every book is written for a reason, other than that there’s a great story to tell – but beneath the story the reader can tell that St John is attempting to influence her readers – getting them to see changes that can be made for a better future. The hardback copy comes complete with a ribbon bookmark, and you’d do well to bookmark the acknowledgements too, in which St John mentions a few ways in which children too could try to have a positive impact on the world, even if they don’t write their own novels. It’s an inspiring list, which I think Makena would try hard to complete. A great story, easy to read, and swiftly devoured. For age 9+ years. You can buy it here. Please note that I carried out some paid work for the publisher on the above title, but this is no way influenced my review of the book.